Vera Zarovitch is a Russian noblewoman -- heroic, outspoken, and determined. A political exile in Siberia, she escapes and flees north, eventually finding herself adrift and exhausted on a strange sea at the North Pole. Crossing a barrier of mist and brilliant light. Zarovitch is swept into the enchanted inner world of Mizora. A haven of music, peace, universal education, and beneficial advanced technology. Mizora is a world of women. Introducing this Bison Frontiers of Imagination edition is Joan Saberhagen, coeditor of Pawn to Infinity and a member of the Very Small Array workshop, a group of science fiction writers in New Mexico. 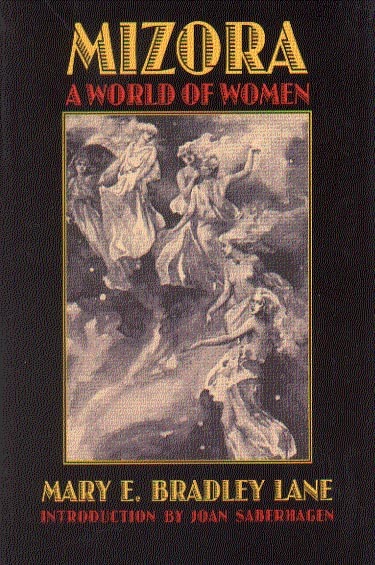 Cover design by R.W. Boeche. The above text taken from the back cover of the 1999 edition. ©1999 University of Nebraska Press. Georges T. Dodds has written a review of MIZORA covering some interesting facts on early feminist literature . The review can be found at SF SITE -- Reviews.